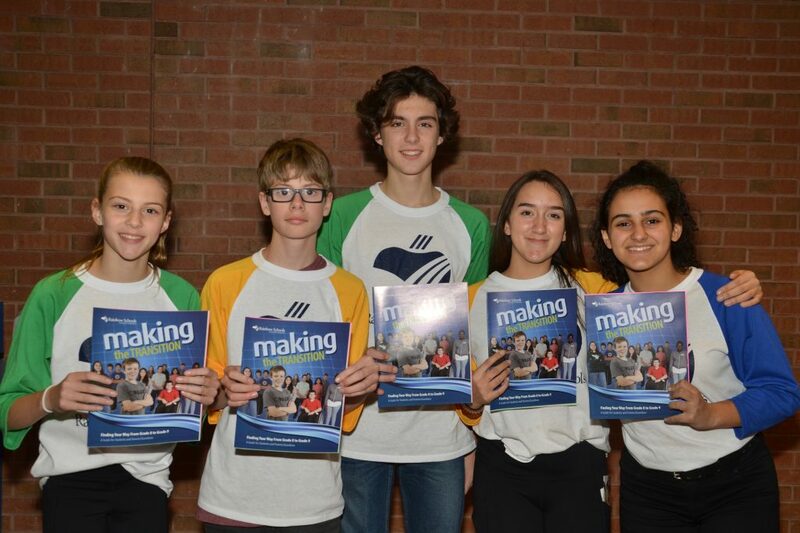 From left, Georgia Wilson of Valley View Public School, James Butcher of Churchill Public School and Harrison Wilson, Apollonia Gil-Alfau and Lara El-Darazi of Confederation Secondary School display the Rainbow District School Board Transition Guide to help Grade 8 students find their way to Grade 9. Grade 8 students and their parents/guardians are invited to Information Nights at Rainbow secondary schools in Sudbury, Espanola and Manitoulin Island. All students are welcome to participate, regardless of which elementary school students currently attend. Rainbow secondary schools offer Specialist High Skills Majors (SHSMs)in a variety of subject areas. These are specialized, Ministry of Education approved programs that allow students to focus their learning on a specific economic sector while meeting the requirements of the Ontario Secondary School Diploma (OSSD). SHSMs assist students in their transition from secondary school to apprenticeship training, college, university or the workplace. Rainbow District School Board offers Specialist High Skills Majors in 13 sectors: Agriculture, Architectural Design, Arts and Culture, Business, Construction, Energy, Environment, Forestry, Health and Wellness, Information Communication Technology, Manufacturing, Mining and Sports. Each Specialist High Skills Major is a bundle of 8 to 10 courses in a selected field. Students learn on the job and can earn valuable industry certifications. The Board also has four specialized programs – the Arts Education Program, the Science Technology Education Program (STEP), the Innovative Integrated Technology Program (InIT) and the International Baccalaureate Program (IB). Busing is offered to the four specialized programs within Greater Sudbury. To learn more, visit rainbowschools.ca and click on secondary education.